Welcome to the Wexler Packaging Products website! Wexler Packaging Products has been in business for 35 years selling quality packaging equipment and supplies. 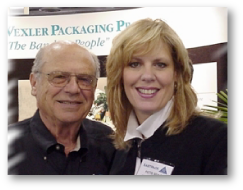 In 1974, my father, Max Wexler, started Wexler Packaging Products selling packaging supplies to end users in the PA/NJ/DE area. I joined the company in 1978 as a salesperson. One of the products that my father had success with was self-sealing paper bands. As industry trends shifted in the late 80s, and master distributors’ became more prominent, our business was diminishing because those distributors were selling to our customers at our cost. It became necessary to specialize & create our “niche”. The decision to focus on self-sealing paper bands seemed a natural one. Through cold calling, I discovered some companies were choosing automatic banding machines as an alternative to hand banding. Thinking this was another trend that would defeat us, one day I asked one of these companies the following questions: What’s the name and model of your machine? Where did you buy it? I contacted that company (EAM/Mosca of West Hazelton , PA) and asked if I could become a distributor. Four years later, they asked if I wanted to take over distribution for the United States. So with one “Sure!”, I went from selling in three states to selling the whole United States, plus Mexico and the Caribbean. I started hiring employees to help with the roller coaster I just got on. Today, we represent ATS-Tanner of Switzerland in 40% of the United States and Puerto Rico for banding and Ravenwood Packaging from Maine to Maryland for our linerless labeling systems. Our partnerships have allowed us to join forces with one purpose, to offer high quality equipment and materials. Packaging solutions for retail applications is growing rapidly. The printing industry still represents about 45% of our business generated annually. Another important niche in packaging would be the much talked about “green initiative”. Along with this Wexler Packaging Products will be introducing bio-degradable poly film for use in ATS Ultra-Sonic banding systems. In 2007, we very proudly announced that Wexler Packaging Products, Inc. is a certified Woman Owned Business. Certification has been granted by WBEC, Woman’s Business Enterprise Council. WBENC certification has enabled us to offer and receive great business opportunities to companies that find the importance in Supplier Diversity partners. We pride ourselves on great service, technical support, and products that we can stand behind. We care about customers in the beginning and after the sale. We don’t have voice mail here; I think that shows our commitment to personally service our customers. We all deliver 110%! At Wexler, we feel it’s a win/win situation…we need you and you need us! Always feel free to contact me directly with compliments or criticism. Companies become great by effectively handling both! To customers – I thank you for allowing us to serve you. For prospects – we welcome your business in the future.